Classic Dr. Seuss tale shimmers with holiday animations and interactivity! This great holiday app masterfully transfers the beloved Dr. Seuss Christmas story and then enhances it with charming animation and playful interactivity. Oceanhouse Media's How the Grinch Stole Christmas! 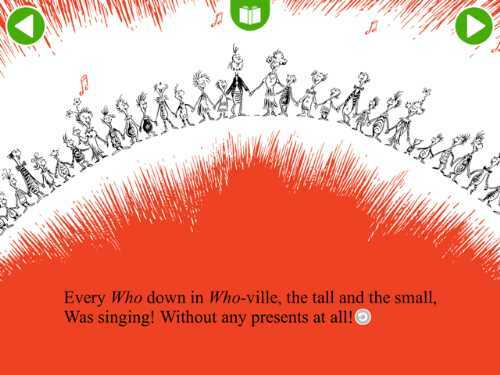 - Read & Play - Dr. Seuss takes a beloved book and improves it with digital wizardry. 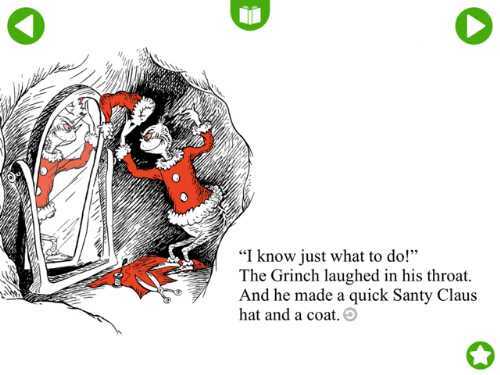 The classic holiday story about how the Grinch transforms from evil to good appears to jump off the page as kids touch, swipe, and tilt their way through the story. With options to read along with highlighted words, read it yourself, or just let the story play in "auto play," this book app offers the perfect reading experience for all ages. Instead of meeting a stationary, inanimate Grinch, this evil ogre glares at you with blinking pink eyes while tapping his foot impatiently. When touched, he growls a "humph!" Through subtle animation of gestures and mannerisms, the Grinch's curmudgeonry oozes across these digital pages in a delightful manner. He is so deliciously bad! Also fun is the way the app brings kids into the story, via the interactivity. They help the Grinch to steal all of the Whos' decorations by tapping on them. When the Whos form a half circle to sing, players run their fingers over the group to hear their voices. And kids can make the Grinch whiz down to Whoville to bring back the toys, the decorations, and, of course, the roast beast! On each of this book app's 28 pages, kids can find a hidden star by tapping on characters and objects in the graphics. The star leads to one of seven types of learning games that include jigsaw puzzles, word searches, memory games, and more. 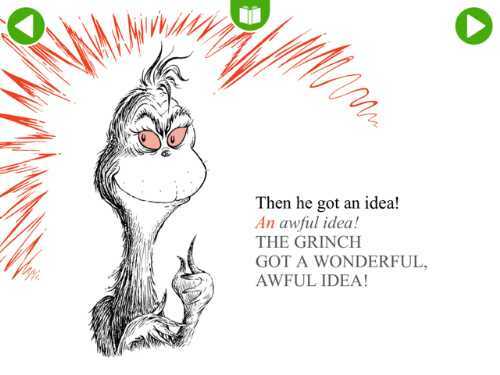 Since the voice of the Grinch is so pivotal to creating a memorable reading experience, I was thrilled to listen to the talented narrator read the story and then change his voice to become the grouchy Grinch. Another excellent feature is that kids can touch any word to hear it spoken aloud. And tapping on items in the scenery leads to their word popping up on the screen above the picture to enable kids to make word-and-picture associations. How the Grinch Stole Christmas! 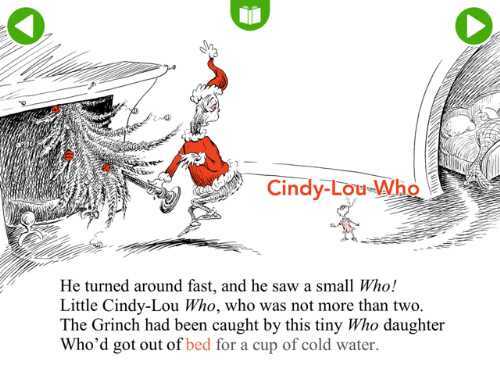 - Read & Play is a fabulous way for families to enjoy the classic Christmas-themed Dr. Seuss book. With the gentle animations, clever interactivity, and the embedded learning games, this digital version does Dr. Seuss proud. Extra Play Activity: Since one of the learning games is about finding hidden objects in a crowded scene, you might want to play a real game with your kids where they collect a variety of Christmas objects. Place them on a table, and then have your child turn away while you remove one item. Then ask your child to name the missing item. If you reverse roles, your child becomes the one sneaking the item away. For more holiday-themed apps, check out our rec list: Fun Christmas & Holiday Apps for Kids. 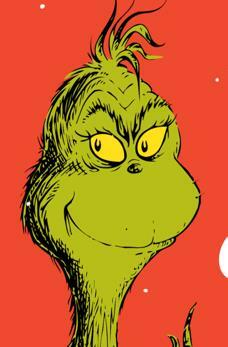 And for Android users, Oceanhouse Media has a separate version called How the Grinch Stole Christmas! - Dr. Seuss which you can read about here. This How the Grinch Stole Christmas! 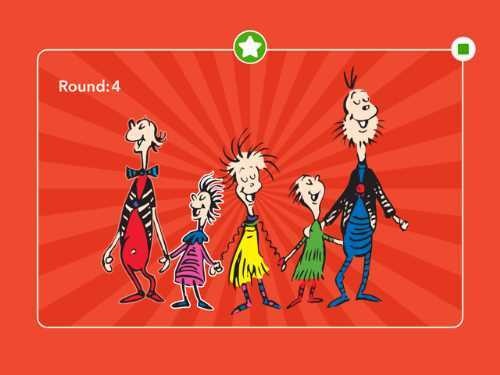 - Read & Play - Dr. Seuss app review was written by Jinny Gudmundsen.